PARIS, Sept. 26, 2018 /PRNewswire/ — The 120-year-old Paris Motor Show opens on October 2 at the Paris Expo Porte de Versailles. The 2018 Show is quite unique as there will be a Chinese auto brand named GAC Motor attending Paris Motor Show for the first time in history, and it is also the only Chinese auto brand that will be exhibiting in Paris this year. An official press conference will be held on October 2, which will take place at booth A530, pavilion 5.2, from 8:45 a.m. to 9:00 a.m. The total area of GAC Motor’s display at the motor show will be 1,000 square meters (10,764 square feet). GAC Motor will bring its high-quality star models to the show which are built with 10-year experience of innovative and creative development. 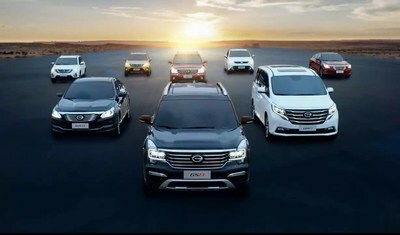 The models GAC Motor will bring to Paris include the best-seller GS4, the high-end SUV GS8, the first minivan GM8, and sedan GA4. Moreover, at the press conference and world premiere, GAC plans to release the all-new SUV GS5. Europe plays an important part in the development of GAC Motor since the early days of its establishment. In 2014, on the 50th Anniversary of the establishment of diplomatic relations between China and France, GAC Motor’s Euro-Asia GS5 fleet travelled from Guangzhou to Paris. This year, GAC Motor returns to Paris with the lofty aspirations of being a “world-class brand and global company” to officially start a brand new journey. As a leader of Chinese automobile industry, GAC Motor has grown into an influential role model for high-end Chinese auto brands. The annual sales volume increased from 17,000 in 2011 to 500,000 in 2017, with an average annual compound growth rate of 75%, and the company has launched operations in 15 countries, completing the construction of overseas R&D centers and business platforms while exhibiting the brand’s acclaimed products at prestigious international auto shows. The Paris Motor Show is the perfect stage for GAC Motor to showcase its products and brand. Bolstered by a successful debut at the Paris Motor Show, the company will look to build a strong brand image in Europe, which is a big step towards its goal of building a world-class brand and global company.